As you decide how to design your new deck, don’t forget about all of the space that will be left open underneath. As you decide how to design your new deck, don’t forget about all of the space that will be left open underneath. Chances are this space will be left unused, especially If you plan to have a raised deck. Before the deck is built, determine what you want to use that space for. Why not build a second patio? The deck itself can provide shelter from rain, wind, and sun. This will allow you to have an outdoor living space that is protected from the elements, which is always a great option to have as summer starts winding down. The space becomes even more functional if you have doors in the right place. If you don’t have doors leading to your second patio, add a staircase instead. The staircase can connect the deck with the patio and make it easier to get to from the main house. Use whatever space you have for additional storage space. This spot makes a perfect place for storing gardening tools, pool toys, and even your lawnmower. Even if there isn’t enough room for adults in the space under the deck, that doesn’t mean the kids can’t fit in there. Consider building a playroom of sorts down there. Put in miniature houses, a huge sandbox, and even a backyard slide that leads from the top of the deck back to ground level. Just keep in mind that the grass down there will struggle to grow, so artificial turf might be your only option for a safe surface for your kids to play on. 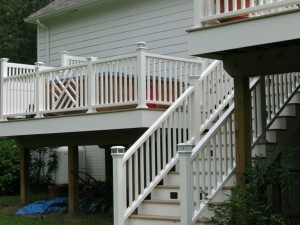 Your new deck, raised or not, can be upgraded into a sunroom or a screened porch. Likewise, you can take whatever room you have underneath the raised deck and convert it into a sunroom or screened-in porch as well. Keep the bugs away and let that cool breeze in, all while enjoying a tall glass of lemonade as a reward for your efforts! In summer or winter, it’s a pleasant refuge from the weather, and your pets can feel connected to the outside world, too.